Dobby’s Minions and the Hot Horcruxes were cheered on during a practice session March 26. No broomsticks were harmed. Chasing after golden snitches while dodging bludgers and scoring with quaffels; if Harry Potter can do it, why can’t everyone else? 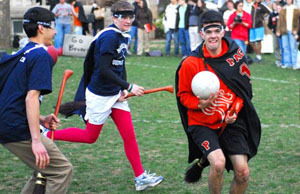 Now Pacific students will have that opportunity as quidditch is slated to be the next intramural sport at Pacific University starting fall of 2011. A source with Pacific Athletics that wishes to remain anonymous said that last week a couple of unidentified students stormed the Stoller Center dressed in full Gryffindor quidditch gear and staged a hunger strike for 10 minutes demanding that quidditch be added to the intramural schedule. “We had to comply with their wishes, we don’t want hungry students on our conscience and their strike made us realize that anything Harry Potter-related is always a good idea,” said the source. Several people have already shown interest and have started forming teams and practicing in anticipation of the fall opening, according to the source. These teams include: the Loony Lovegood Loving Llamas, Muggle-Maniacs, Moldy Voldys, Hot Horcruxes and Dobby’s Minions. Quidditch, which was adapted for muggle play in 2005, began as an intramural league at Middlebury College in Vermont. Since this time, ground quidditch has grown in popularity and now more than 400 colleges have active teams. To get some extra practice in before quidditch makes its debut at Pacific, the Muggle-Maniacs and Moldy Voldys will merge and participate in the 2011 North Eastern Regionals. The tournament will be held at Boston University on April 10. Goal posts will be installed in Lincoln Park during the summer.